And their matching OOTDs are always designer! The internet slang “twinning” may have been coined at the beginning of 2015, but it was 2016 when the craze reached greater heights with everyone (from couples to BFFs) joining in to post their own matchy-matchy OOTDs online. And while we had our eyes on a lot of them, Marian Rivera and her daughter Baby Zia’s twinning moments clearly topped the list of our favorites! 1. Their very first twinning moment happened just a few weeks after #MariaLetizia was born. The two shared not only a very touching mother-daughter moment but also an identical OOTD featuring printed boho dresses in pink by local designer John Paras. 2. It was shortly followed by another twinning look (also by John) for the 2016 New Year’s Eve—in polka dots, of course! 3. 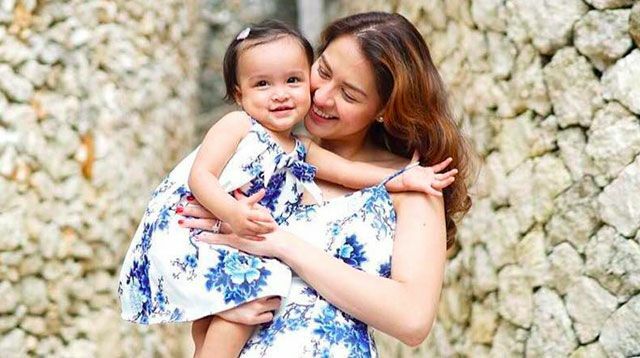 For her mom’s birthday celebration last year, Marian turned to another local designer, Mariane Perez, to create a set of matching floral frocks for her and Baby Zia. 4. The same designer also made the red lace dress Zia wore on her first birthday—with a matching dress for Marian, too, obviously! 5. We spotted them twinning in Dolce & Gabbana a few days later. Naturally, Zia’s taking after her mother’s lavish taste in fashion. 6. Also from the Italian fashion house, Marian’s printed top and Zia’s dress were perfectly in sync. They even completed their matchy-matchy looks with pink purses from S'uvimol! 7. Cute and casual on Christmas day, the mother-daughter duo once again knocked twinning out of the park with their red polka dot shirtdresses by Mariane Perez. 8. Even their swimwear game is strong! During their recent family vacation in Bali, Marian and Baby Zia both wore rose-printed maillots from D&G’s Spring/Summer 2017 collection. 9. Not just once but twice—this time, in matching cobalt blue swimsuits! 10. Resort dressing, anyone? Give way for the ladies in red; these two set the bar higher for mother-daughter dressing yet again. 11. Marian and Zia had another twinning moment in Dolce & Gabbana, both wearing foliage print dresses with white steppers to boot. 12. Their final matchy-matchy OOTD for 2016 blew everyone else out of the water. Donning blue and white floral frocks by Mariane Perez, the two officially defined our #twinninggoals. 13. Marian and her mini-me dressed in their Sunday best—matching orange dresses decorated with falling blossoms. Hello, 2017!